We are now up to the fifth episode of Thai noodles already. After you’ve been eating so much poultry, it’s time to switch the source of protein, don’t you think? I do. This time I offer an easy recipe for slow-cooked beef with noodles that I actually want to call beef stew, but I’m afraid that it will set the wrong expectation for you. 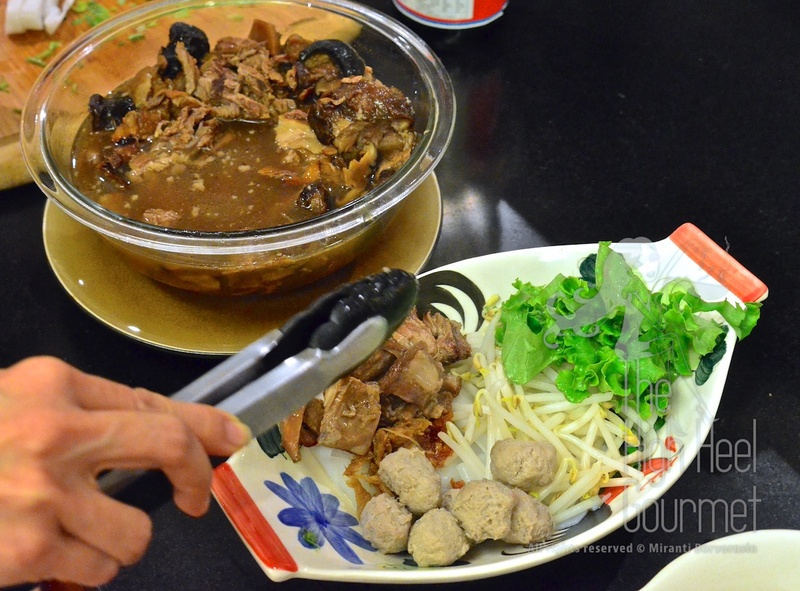 The Thais won’t eat the thick beef stew with noodles. In fact, there are really no noodle dishes with thick, stew-like broth except for curry with noodles, of which we only have two kinds. One is the Northern Thai Curry Noodles that I already gave you the recipe for. The other one is coming soon. 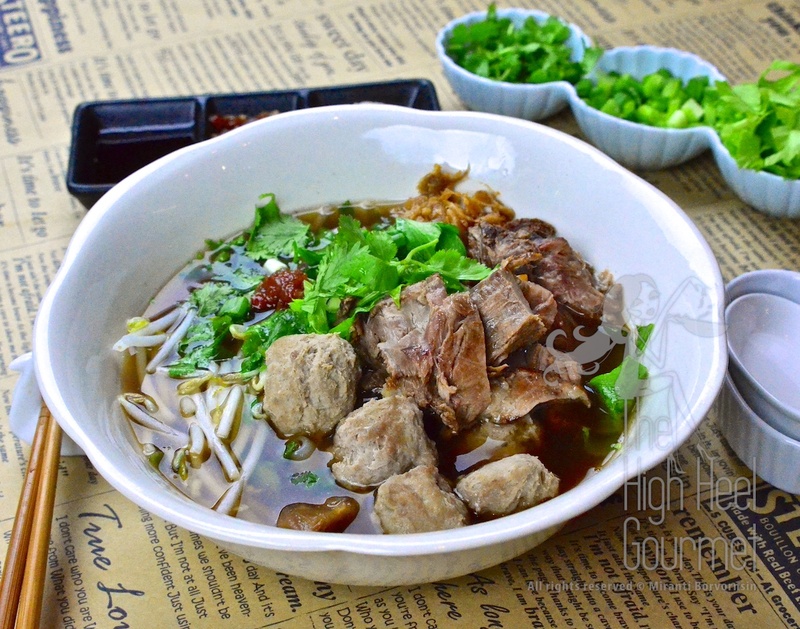 I blame it on the hot Thai climate that doesn’t make eating hot, thick broth seem appealing. Most of our noodles are in a thin broth. When we have noodles with thick gravy we normally eat them with Kanom Jeen—the rice noodles—more than Guay Tiew. The dish looks and feels more like pasta. Kanom Jeen Sao Nam, Kanom Jeen Nam Ya Tai are good examples. Back to our slow-cooked beef then. 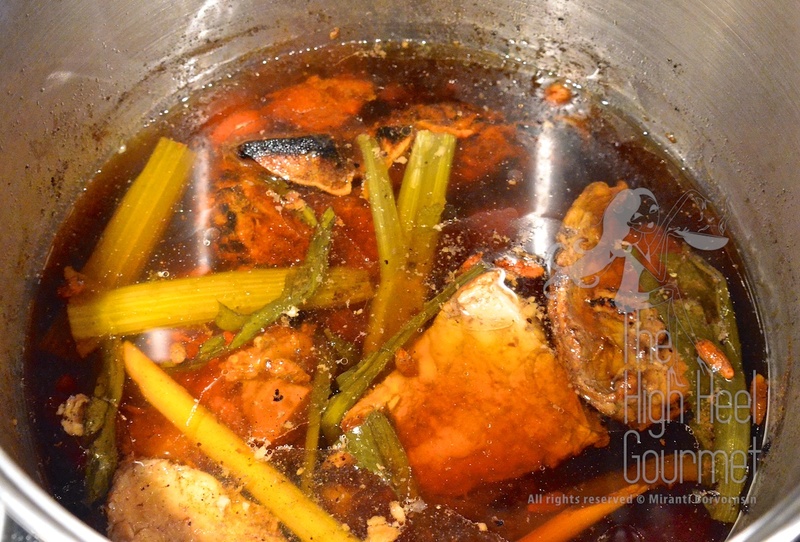 Yes, we are going to make a thin broth full of herb and spice aromas. This dish is good for any time of the day, but especially right after clubbing or a party where you might be drinking and dancing a little too much. 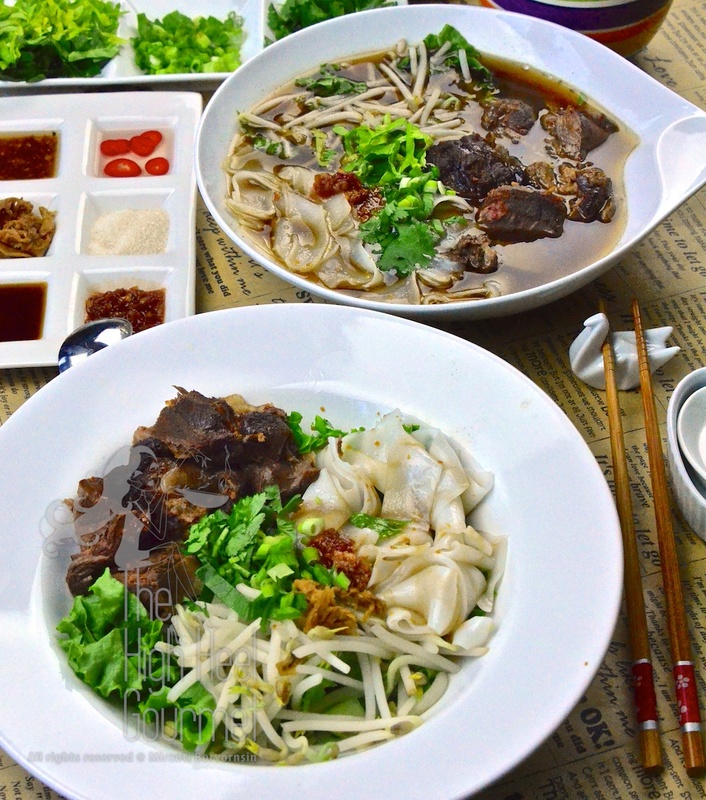 Anytime I went out to a club, at the end of the night I always wished I were in Bangkok where I could find a street vendor selling beef noodles, or noodles with dumplings. How can you identify Guay Tiew Neau Toon on the aroma-filled streets of Bangkok? 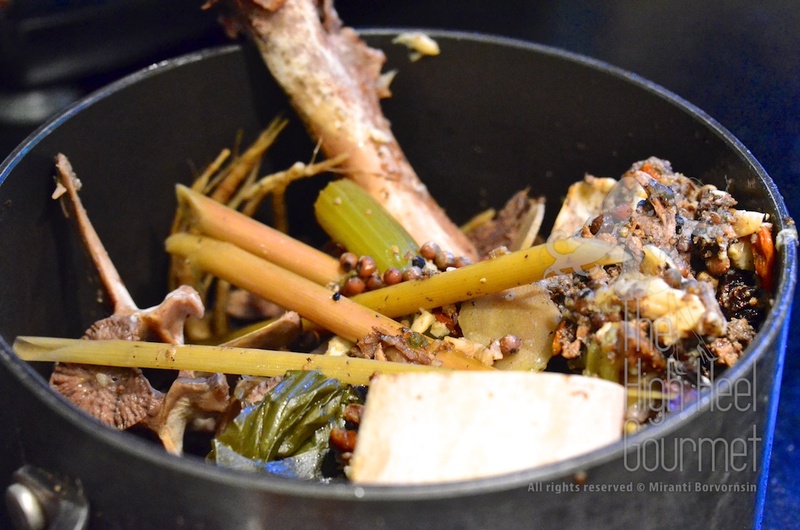 You will see a pot filled with the slow-cooked beef on the cart. Or after you cook this recipe, you will remember the aromas…mmmmm. I listed a lot of “optional” ingredients because they are actually your own preference. Some vendors might put different spices or herbs, and some just stay with the basics. You can invent your own, but I recommend asking me or some other Thai person nearby first just to see if it is okay to serve it that way. Another violation is carrots. If we want to sweeten our soup base naturally, we will use turnips or onions, but not carrots. Do you know why? Because the carrot is not part of our heritage vegetables. We only started growing them a short time ago. Less than forty years ago carrots were still labeled as “Western vegetables”. Please don’t just think anything with a combination of lemongrass, kaffir lime leaves, fish sauce and coconut flakes all together will be approved by the Thais as “Thai food”. I’m not even talking about what is authentic; if your dish can’t even be accepted as Thai food by the Thai, may be you should respectfully consider dropping the country name from it. (When I say “Thai food” I mean the food that Thai people would cook and serve in their household–I’m not being pretentious.). 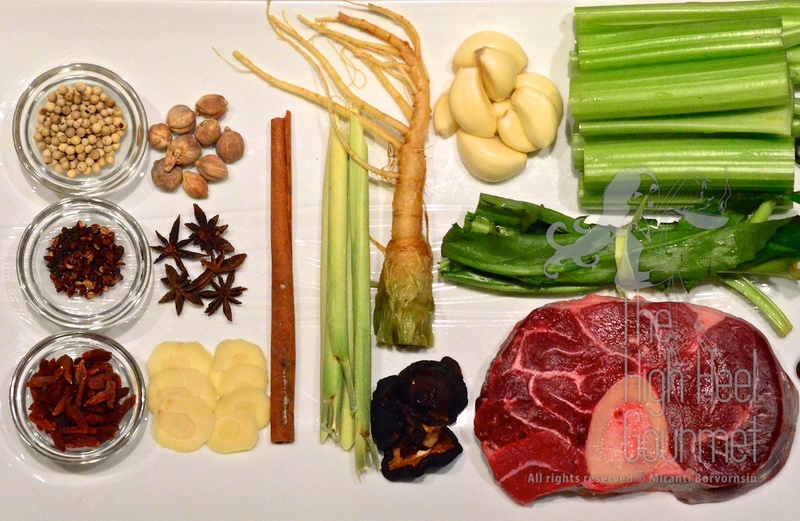 I can guarantee with all my Thainess that the recipe that was published and labeled as “Thai Beef…blah blah…” mentioned above was SO NOT Thai food. We have our principles in our culinary art and we hope that it will be respected. This is one of the main reasons why I write my blog. You can always add or subtract the ingredients as you prefer. But if it is far from this recipe, you can call it your own noodles dish; no need to add “Thai” to the name. 1) Place all the broth ingredients in a pot with the water and bring to a boil. Once it reaches a boil, lower the heat and simmer until the meat falls off the bones, about 2-3 hours. If the water level drops below all the ingredients, you can add more water, but I didn’t have to add to mine. The broth should be clear, not cloudy. If it is so cloudy, you are using too high a temperature. Reduce the heat next time, but it’s still okay to use what you have now. 2) Turn off the heat, cover the pot with a lid, and leave it overnight. 3) The next morning skim all the fat off the top. If some herbs or spices come with it, it’s okay too. We’re about to strain all of them out. 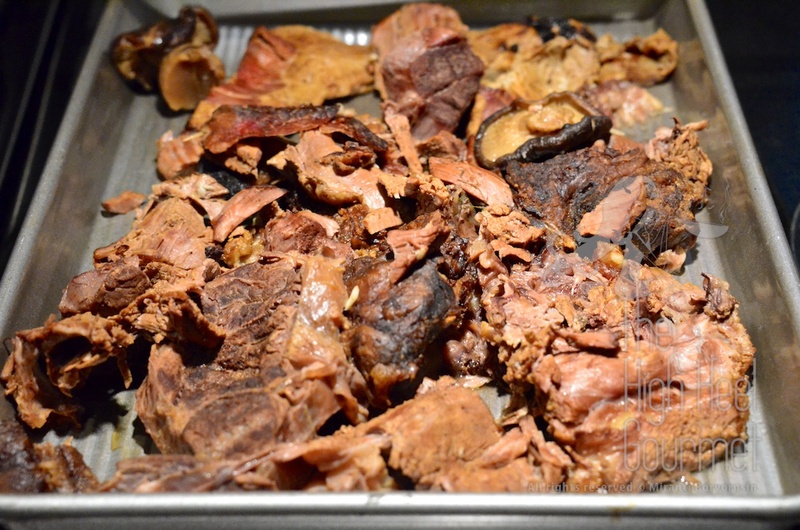 4) Take the meat out of the soup and cut into bite-size pieces. keeping the broth and discarding the rest. You can keep the mushrooms in if you like. You should end up with a soup that is brown but semi-transparent or clear, with a full herbs and spices aroma. You can also season the soup to your personal preference, but I keep mine pretty mild tasting. 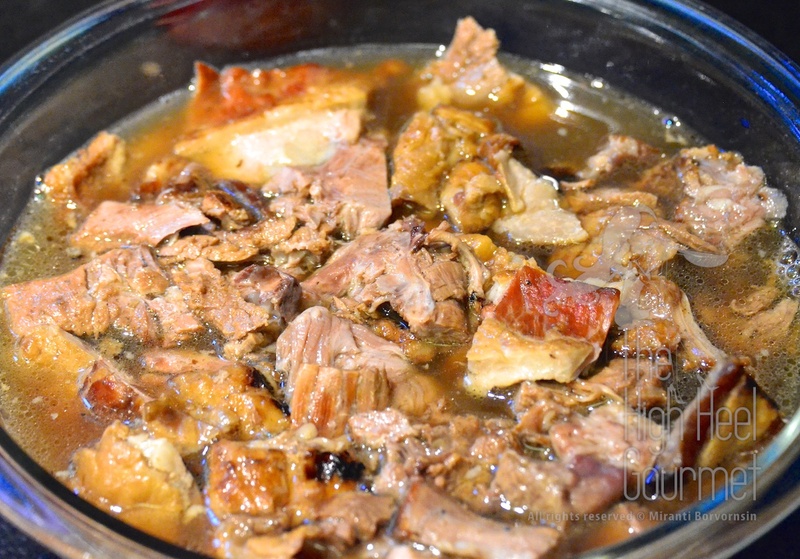 5) Put the cut-up meat in a separate pot and add broth, just enough to cover the meat. Heat until it reaches a boil, then turn off the heat. You shouldn’t let it simmer any longer, but try to keep it warm for the noodles. Noodles of your choice, as much or as little as you want, or none at all. 1) Boil a separate pot of water, and also heat the remaining broth that you already strained all the herbs out of. 2) Put chopped green leaf lettuce in a bowl. Once the water reaches a boil, cook the bean sprouts and the noodles, then add them to the bowl. 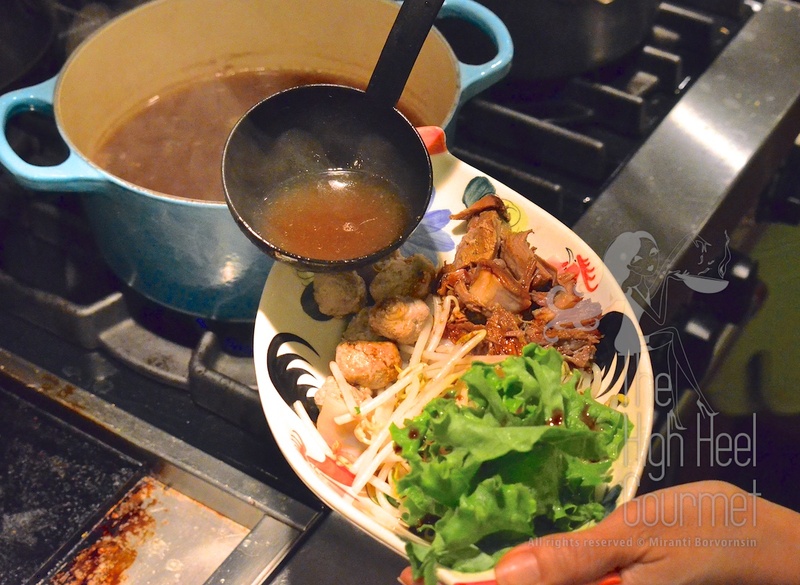 3) If you like to add meatballs or sliced beef, cook them in the broth and add them to your bowl. 4) Take the slow-cooked beef and add to the bowl. 4.1) If you want to eat your noodles soup style, add the broth to the bowl and add the accompaniments, except the sweet dark soy sauce, then season to your preference. 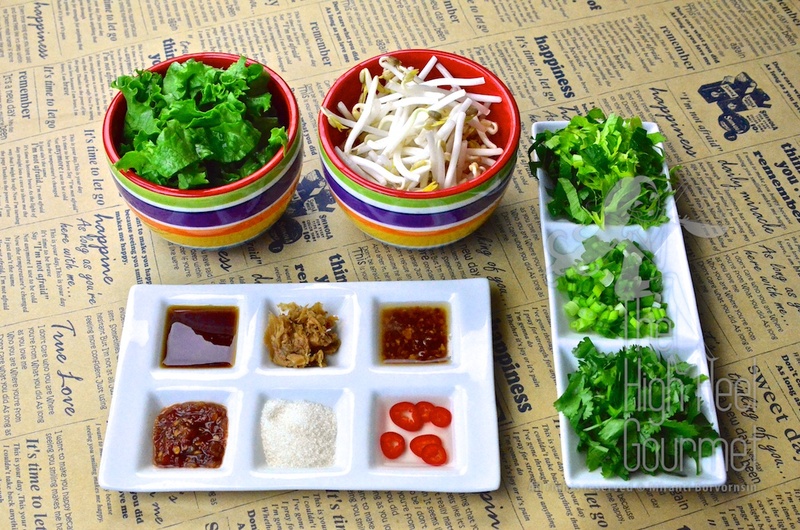 4.2) If you want to eat your noodles salad style, add the sweet soy sauce first then add all other accompaniments. Season to your preference. Low carb option: Of course, you can prepare this dish without the noodles. It’s called Gao Lao Neau Toon. Of you can swap the noodles for steamed rice as well. 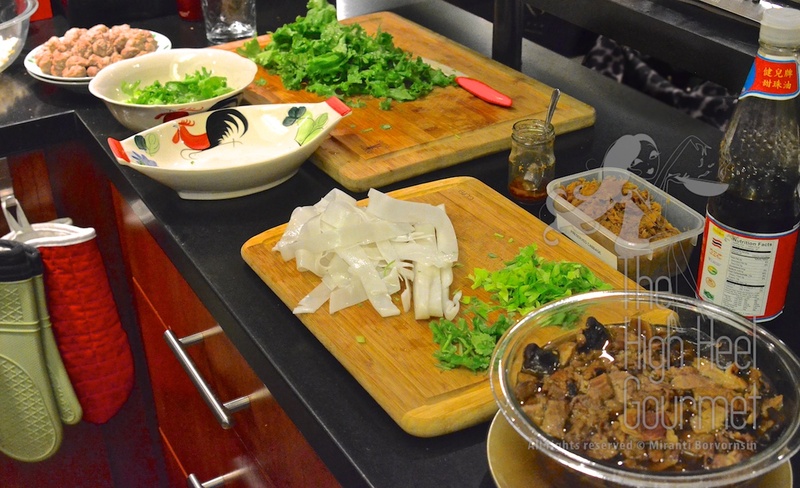 This entry was posted in All Day, Beef Bison Buffalo, Boil, Breakfast, Chinese, Clicking in the Kitchen, Comfort Food, Dinner, Gluten Free, Healthy Food, Lunch, Malaysian, Noodles, Singaporean, Snack, Soup, Stew, Thai, Thai Noodles and tagged Asian, Cooking, Easy recipes, Food, gluten free, Noodles, Recipe, Salad, Soup, Thai food. Bookmark the permalink. I have 2 questions. The first is whether if I cook the staple ingredients with just the optional ingredients of galangal and lemongrass whether you would say that would work. The second is I’m a bit confused by the accompaniments. Do they HAVE to go in the bowl when you eat the dish or are they just there to add optionally? Ie do ALL the ingredients go in the bowl? Or just some of then? or none of them or…? I’m confused with your questions but try my best to answer. 1) You will cook staple soup ingredients TOGETHER with your optional choices. 2) The accompaniments, you add what you like in the bowl, either a few, a lot or none are all up to you. I don’t like celery, so I don’t put them etc. Then you toss all of your noodles, vegetables, beef and your choices of accompaniments together before eating. Hi there. Thanks for the recipe! I’m going to try a slow cooker version. Did you ever publish your recipe for the meat balls? I’m living in Thailand and love a good bowl of kuay teow neua toon. 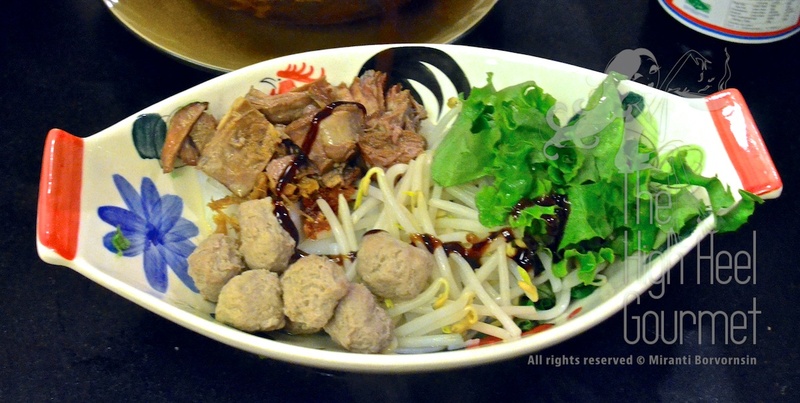 I’m not a big fan of the meatballs they normally use (kind of a rubbery processed American hot dog type texture and flavor – in fact very similar to the Indonesian bakso which is also delicious except for the meat balls!) so I’ve been wondering if there was a more traditional approach that may have fallen out of common practice? Or is that beef noodles weren’t really that traditional in the first place and maybe came along late enough to have used the processed meat balls since the beginning? Meatball was introduced by the Chinese and also ruined by also the Chinese. They added flour and borax. You can try making your own. One cup ground meat, 2 tablespoons fish sauce, pinch of sugar and pepper. You can grind them in the food processor with one or two ice cubes (important) then keep them cold before drop them in the hot water to cook. If you can find all spices. Thus is not that complicate to make too. Wow, excellent recipe! Reminds me of the soup I’d eat at a couple noodle shops in Chiang Mai. Also, fabulous new home page. The pictures helped me discover this recipe. Otherwise I may never have come across it. This dish look wonderful, it seems like a lot of preparation. But the end result is very rewarded. Will give it a try some day. Now I have to go eat something. Can you find seasoning sauce that has no MSG? I’m using the Healthy Boy brand and that has no MSG. I’m very allergic to MSG too. You would need some kind of Chinese soy seasoning sauce or else the flavor doesn’t come out the way it should be. I used to use Kikkoman sauce and boy I learned! Even the Japanese soy sauce can’t be used to substitute. Oh yum! I forgot about this dish. My Auntie made it for a festival party at our house I think. 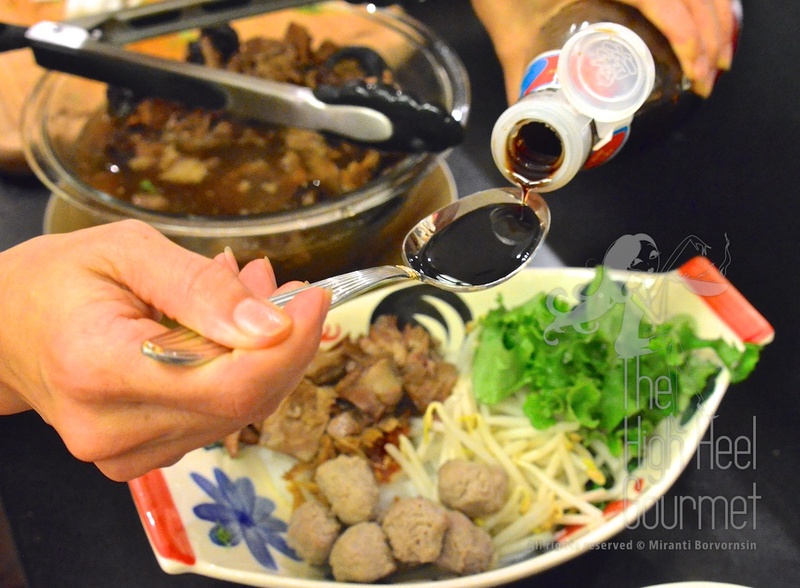 She used a whole pineapple in the broth for sweetness which also helps tenderize the beef. I am going to give this a try this weekend! You remind me of the pineapple! Yes, if the beef is not as tender (like most local beef in Thailand) they use pineapple in the soup to add the sweetness and also tenderized the meat. I’ve found it very pleasing too but I totally forgot since beef here is so tender I never though about using the pineapple again…Thanks Candy!